If there’s one animated tv show that offers lots of insights and laughs, it’s got to be Futurama. The highly engaging animated show commenced in 1999 but aired its Futurama Season 7 finale in September 2013. Nonetheless, viewers had a blast with the hilarious and at times, dramatic or thought-provoking episodes that were aired. Futurama oftentimes used popular tv shows or movies and books as references. One episode, “How Hermes requisitioned his groove back” uses the novel and film “How Stella Got Her Groove Back” as reference. That episode underscoresd the advantage of managerial skills, work-life balance, productivity, and work ethic. In Futurama Season 7, the romance that has been brewing between Fry and the one-eyed alien Leela fully blossoms. Fry uttered sweet lines in several Futurama episodes, like when he declares his love for her. In one episode entitled “Leela and the Genestalk,” Leela develops tentacles all over her body, and when Fry sees her, he shrieks in surprise, but later tells her that whatever happens, she’ll always be the woman he loves. For a long time, Futurama’s loyal followers had wondered how things will play out for Fry and Leela. Their love shows how love transcends planetary origins many fans wondered if Fry and Leela would ever get together and be truly happy. Though Leela and Fry’s relationship had seemed ambiguous, in Futurama Season 7 they get married, warming the hearts of many fans. The two characters were also presented traveling all over the world, and aging together. Their journey ends at the top of the Vampire State Building. During the last episode, the Professor resurfaces to fix the Time Button. Overall, Futurama was a wonderful animated program that viewers identified with. There were some Futurama episodes that focused on heady sci-fi concepts, corporate essentials like teamwork and trust, plus insights on love and relationships. Among the many Futurama episodes, there was even one which tackled genetic modification/engineering in a somewhat eye-opening manner, at least as far as GMO advocates are concerned. The good thing about an animated tv show with endearing character is that a serious issue can be presented without being preachy. In the episode where Leela grows tentacles because of a genetic condition termed squidification and finds a secret genetic engineering facility, she makes a discovery. The discovery may be something that some people may be making in real life – that genetic engineering may have its downside (like how chemically tainted food supply may lead to illness) and upside (address modern infirmities). In effect, that particular episode sent across the message that while consumption of GMOs may possibly have negative effects, the biotechnology industry may, after all, be heroes that can offer solutions to serious problems. 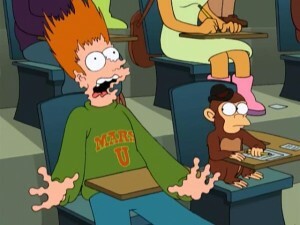 Even in the episode tackling a serious topic like genetic engineering, Fry, Bender and Leela continued to be amusing, This is evident in the scene where Fry tells Leela that there’s nothing about her body that can ever shock him so, but screams when she uncovers and shows him her tentacles. If you love futurama, also check out the interesting characters and storylines that are found throughout here.